your computer with internet access. Live Webinar Demo. You will be able to participate onsite or will be able to join in the webinar remotely. To view in other time zones or languages, please click this link. Security is not just important when you are doing financial transactions - an insecure Web site can be used by others for malicious purposes to launch attacks against other Web sites. There are a few must-knows for anyone who ventures out into the world of PHP Web development. In this webinar, Zend's Kevin Schroeder will focus on the absolute necessities when doing secure Web development. Product Description (from Amazon). 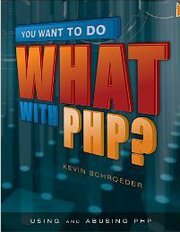 A creative look at the fundamentals of PHP programming, this manual shows practical but atypical examples of PHP code. Theories, considerations, and varying options--such as binary protocols, character encoding or scaling PHP applications with messaging--are presented as new approaches to solving problems. Taking into consideration operating system level options, this programming reference goes beyond the basics to offer more advanced and innovative options for building PHP applications.